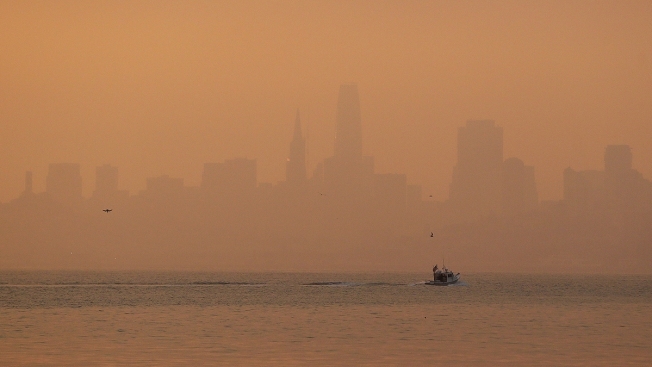 The San Francisco skyline is obscured by smoke and haze from wildfires Thursday. A smoke advisory and Spare the Air alert have been issued for Monday in the Bay Area, air quality officials said Sunday. The Bay Area Air Quality Management District recommended that people, especially in Napa, Sonoma and Solano counties, stay inside when possible in buildings with filtered air such as public libraries and shopping malls; or people in the fire-impacted areas should leave the area for areas less impacted by wildfire smoke until the smoke levels subside. People who must stay in the fire-impacted areas should wear an N95 mask to minimize breathing harmful particles in smoke. Air district officials urge people to protect themselves and their family from heavy smoke. Residents who see or smell smoke in their immediate area should stay indoors, if possible, with the windows and doors closed and air conditioning units on recirculate. Air district officials are asking residents and visitors to avoid adding pollution to the air by cutting back on activities such as wood burning, lawn mowing, leaf blowing, driving and barbecuing.